This paper analyzes the relationship between GNP per capita and energy consumption per capita for 43 market economies during the years 1978, 1979, and 1980. Several functional forms are analyzed. Specification tests establish that a double logarithmic equation is preferable to all others. Statistical estimates further indicate a distinct pattern of diminishing real income response to greater per capita energy consumption. Advanced economies with relatively low-cost energy (Canada, Norway, the U.S.A.) exhibit practically identical per capita incomes as industrialized nations with higher-cost energy (Sweden, France, and the Federal Republic of Germany). This article provides a value maximization strategy for end-use R&D planning which meets both supply-side and demand-side R&D objectives. The strategy is compatible with conventional econometric market analysis, power system demand-side management or least-cost planning methods, and operations research approaches common to manufacturing. The strategy permits incorporation of supply and demand uncertainties into the R&D planning process. It also provides a methodology for determining the optimal set of R&D investments. These R&D investments will result in products that increase the value of electrical service, promote the efficient operation of electric power systems, and ensure the productivity of manufacturing operations. A substantial share of domestic energy supplies is produced by the oil and gas production industry. The oil field services industry provides valuable assistance to these exploration and production companies. The failure rates in both industries have increased recently. Failure rates in the two industries were modeled as a function of general economic conditions, industry financial conditions, and, in the case of the service industry, the failure rate in the production industry. The failure rate in the production industry was most sensitive to general economic conditions; while changes in the rate of drilling success led to the largest percentage change in the failure rate in the oil field services industry. The oil field service industry's failure rate was also significantly related to the failure rate in the production industry, thus indicating a spillover effect. Policymakers and lending institutions that finance and regulate these vital energy supply industries may benefit from the empirical results. The paper reports a method of estimating aggregate residential electricity demand elasticities with respect to price and household income. Short-run models of electricity use and linear probability models of equipment ownership are developed using household data. These are incorporated in a model that simulates the development of the stock of dwellings and electricity-using equipment through time to derive short and long-run price and income elasticities. Results for a wide range of equipment types are presented. Test results reveal the influence of dwelling stock dynamics on long-run aggregate elasticities that have not been reported in other studies. This article analyzes the own-price elasticities of natural gas and cross-price elasticities between gas and other fuels in France and West Germany. A model with constant substitution elasticities would not give enough information to study interfuel competition. Therefore we adopted a model based on translog functions, which has few restrictions on measuring elasticities of energy demand. In this paper I look at some major domestic markets for natural gas in developing countries and the conditions that must be met for a gas project to be realized. The residential and commercial sectors are not favorable unless a demand exists for space heating in the winter and this will apply to relatively few cities in the third world. The prime candidates are electric power stations, where gas is most suitable for combined cycle (in shoulder or base loads) or steam turbines (for base loads). A wider role for gas in electricity generation depends upon a shift away from hydropower or coal. Electric power planners in developing countries have the oppor-tunity to anticipate air conditioning-induced demand peaks, rather than merely react to them, as has happened in the United States. Demand-side management activities targeting future air conditioning installations therefore may be warranted, based on economic efficiency considerations, the U.S. experience, and worldwide trends in air conditioning usage. The feasibility of such anticipatory efforts is likely to hinge on local parameters, including domestie energy supplies, foreign exchange and capital constraints, rates of load growth, evidence of impacts on load profiles, and familiarity with demand-side planning concepts. Through case studies in rural and urban settings within Nigeria, this paper examines the degree to which qualities associated with commonly proposed new energy supply technologies for developing countries satisfy the needs and preferences of Nigerian households. 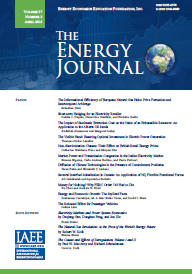 The paper demonstrates that the often cited, and unquestionably important advantages of such technologies, including ecological safety, renewability, decentralization of supply systems, and diversity are not factors which carry sufficient appeal to individual households in determining fuel choices for domestic purposes. The study finds that safety, reliability of supply, convenience, and a fuel's versatility are the factors which determine its desirability. This paper analyzes implications of open access forestry for traditional energy programs in LDC's. The role of improved woods loves, charcoal kilns, forest-access and biogas programs is examined. A key finding is that, with sufficient elasticity in fuelwood demands, traditional energy programs may reduce long-run fuel wood supply stocks. Concern over deforestation in developing countries has led to increased interest in fuelwood markets, particularly the major market in cooking fuels for urban populations. This case study of Raipur, India, examines the use of cooking fuels by households and small commercial users, with emphasis on the role of fuelwood. It finds that total cooking energy consumption per household (in Btus) is relatively constant over a wide range of household income. However, the composition of fuel supplies varies with income, from a low-efficiency wood-based system in poor households to a higher-efficiency LPG-based system in higher-income households. Consumers evince a strong preferen-e for modern fuels, supporting the general pattern of inferiority of traditional fuels and the transition to modern fuels with increasing incomes. This article considers some key elements of the current debates on utility deregulation and industry restructuring. Its purpose is to bridge the gap between economic theory and actual regulatory policymaking. The author explains that the emphasis of regulatory debates has, in large part, shifted from rather routine cases to matters that fundamentally affect market structure. Jurisdictional issues, difficulties associated with determining how to relax regulation of an industry that still has monopoly elements, and problems with the process itself are addressed. The author concludes that important and necessary policy debates would benefit from more substantive dialogue among all involved.